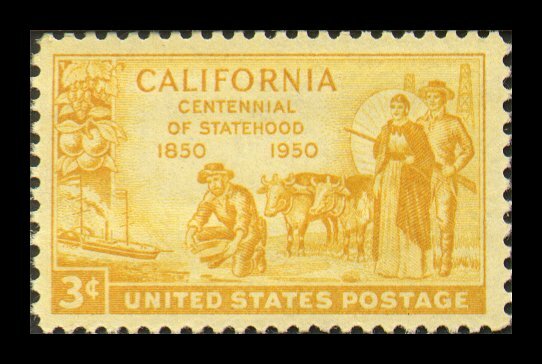 September 9, California Statehood Day 2015; Golden Staters, fly your flags! 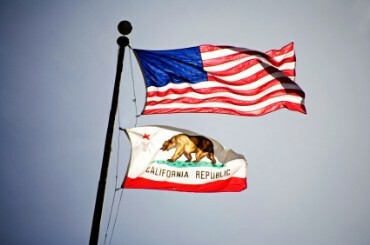 California residents fly their U.S. flags today in honor of California’s entering the union this day in 1850. U.S. Flag Code guidelines list specific days Americans should fly U.S. flags, and generically, urges people in states to fly flags on their state’s day of achieving statehood. It’s fun to read through the list of statehood dates and ponder just how such a date is calculated (consider the first 13 colonies and their becoming states); but however it was calculated, September 9 is California’s day. U.S. and California flags flying from the same flagpole. 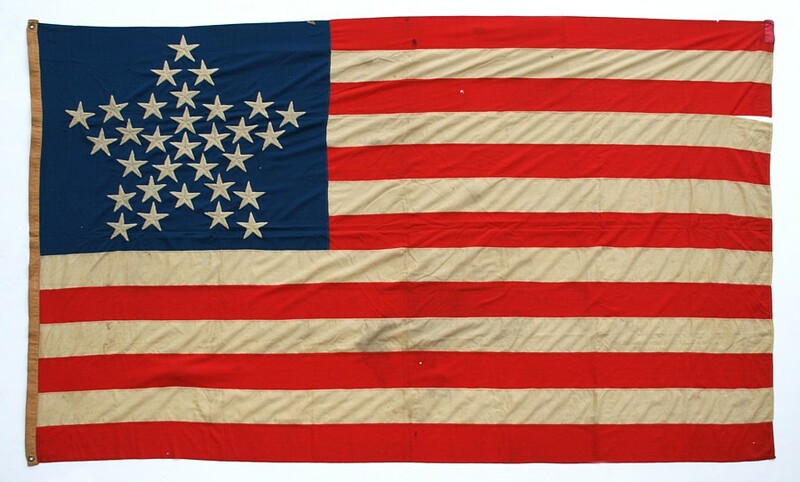 31-star flag with stars arranged in “Great Star” constellation suggested by War of 1812 Navy hero Samuel Reid, a wearer of the Congressional Medal of Honor. Reid urged 13 stripes instead of 15, which Congress accepted; but he also urged the Great Star design, which was not accepted. Placement of stars in the field remained unencumbered by rules until the Eisenhower administration. Photo from Jeff R. Bridgman Antiques. Yes, this is mostly an encore post. Fighting ignorance requires patience, and in the case of history tied to specific dates, repetition. This entry was posted on Wednesday, September 9th, 2015 at 12:04 pm and is filed under Flag etiquette, Fly your flag today, History, Tradition, U.S. Flag. You can follow any responses to this entry through the RSS 2.0 feed. You can leave a response, or trackback from your own site.